Kazima Pure Natural Raw Aloe Vera gel from the foothills of the Uttarakhand Himalayas, heals and nourishes your skin and keeps it young, radiant and beautiful.It is used to effectively heal chronic dry skin.This 100% Pure Natural Aloe Vera Gel free from chemical additives, contains vitamin E which helps removes acne scars, soothes burns & sunburns, prevents dandruff, lightens stretch marks and prevents wrinkles.Aloe vera gel contains two hormones: Auxin and Gibberellins. These two hormones provide wound healing and anti-inflammatory properties that reduce skin inflammation. 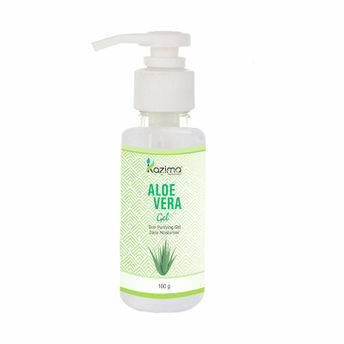 The gentle healing and nourishing properties of Aloe Vera are completely preserved in this product. Additional Information: Kazima Perfumers is a one stop destination where you get hold of wide range of pure attar oils, essential oils, hair oils and other skin and hair care products. Their mission is to provide complete satisfaction and meet the requirements of their valued clients through premium quality products. The brand manufactures, supplies and exports a wide variety of attars, essentials oils that are 100% Pure Natural and Therapeutic Grade Oil, all manufactured in conformation with international standards of quality. Shop more Kazima products here. Explore the entire range of Lotions & Creams available on Nykaa. Shop more Kazima products here.You can browse through the complete world of Kazima Lotions & Creams .Alternatively, you can also find many more products from the Kazima Aloe Vera Gel range.